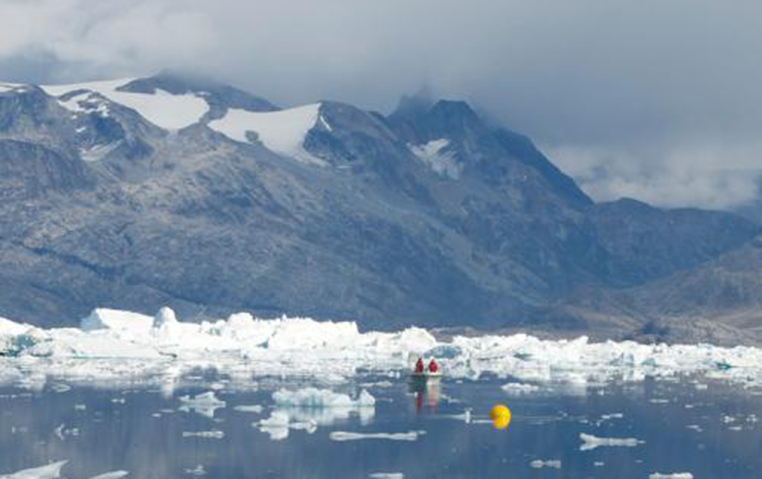 UO geologist David Sutherland is part of a research team that has provided an all-new look at the connection between the ocean and Greenland’s outlet glaciers. The findings, the team reports in the journal Nature Geoscience, should help scientists more accurately project how fast the Greenland Ice Sheet is melting. This 2-mile thick, 1.7 million-square-kilometer ice sheet accounts for one-sixth to one-fourth of current estimates of the global rise of sea levels, says Sutherland, assistant professor in the UO Department of Geological Sciences, who worked with scientists at the Woods Hole Oceanographic Institution, on the project. Sutherland earned his doctorate at the institution; he joined the UO in 2011. “The ultimate motivation of all this fjord-and-glacier work is to improve predictions of global sea level rise, as well as understand where the increased freshwater input from the Greenland Ice Sheet is going once it enters the ocean,”​​​​​​​ he said. The research is detailed in the story Understanding the ocean's role in Greenland glacier melt.